When most people think about Muay Thai, one name comes to mind: Nathan Corbett. Well, that’s what comes to my mind at least. Nathan Corbett, aka “Carnage,” is an 11-time Muay Thai World Champion. This guy is the real deal, and if you have any interest in the Martial Art, you should know who he is. I’m here to help you out. Born in 1979, Corbett is already retired. That should give you a hint as to how intensely this man trained. He began practicing martial arts with karate at age 14, then moved to study shoot boxing and Muay Thai in later years. He became a professional in 1997, rising to national acclaim in 2002 when he defeated the Australian legend Scott Bannon, also known as “The Cannon.” Corbett then won his first WMC World Title over Clifton Brown of Canada. 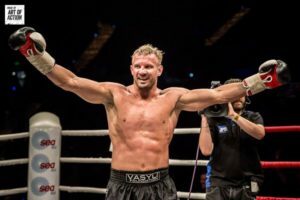 He was the WMC Muay Thai Cruiserweight World champion, the K-1 Scandinavia 2007 tournament champion, and the former World Kickboxing Network Muay Thai Heavyweight World Champion. This guy is the real deal. Corbett’s career is inexplicably tied to the career of Tyrone Spong, another famous Muay Thai fighter. The two fought for the first time in 2009—a major test for Corbett. At the time, Spong was the most decorated fighter he had challenged; additionally, the rules were modified to eliminate Corbett’s ability to use his elbows. In one of the most famous moments in Muay Thai history, Corbett knocked Spong out in the third round. The referee stopped the fight, but Corbett misinterpreted the halting as a restart, beginning to strike Spong further. The referee ruled the fight a no contest. Known colloquially as “the elbow master,” Corbett is known primarily for his slicing right elbow, which won him the match against Scott Bannon. This impressive fighter continues to train and teach Muay Thai around the world, co-leading the Ronin-Carnage Team alongside Misa Ronin in Novi Sad, Serbia. In the spring of 2018, Corbett hosted several seminars across the country, teaching students his signature elbow strikes and Muay Thai leg kicks. So this is, apparently, what retired fighters do with their time. They teach and they train, they train and they teach. Just because Corbett is retired from fighting doesn’t mean he’s out of the game. Far from it—he continues to practice Muay Thai every day. To this day, Nathan Corbett is one of the most recognizable Westerners to compete in Muay Thai. At just 38 years old, this is quite the accomplishment. He is also a regular contributor to FIGHTMAG, where he writes the “Carnage Diary.” If you have any interest in Muay Thai, you should read his column—it’s absolutely fascinating.